Suddenly it was summer. After some fairly mixed days during the first half of June we had the hottest day of the summer so far. At least down here in the south, on Arran in Scotland they had the worst downpours in living memory. 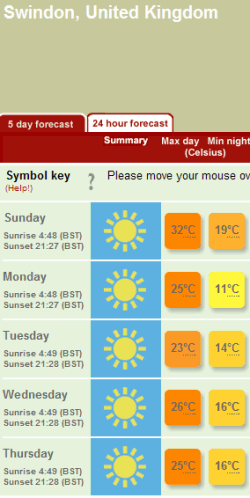 If I can trust the forecast for the next few days it will remain sunny, but should be a bit cooler. As I don't cope with heat very well I'm looking forward to some cooler weather, especially after reading of some blogger casualties. Gute Besserung, Ralf! With it being so hot today I decided to stay at home, which allowed me to make some good progress with the WalkIslay 2005 travelogue: The page for the Kilchoman to Kilchiaran walk is finally complete (incl picture of Granny's Rock). I also completed a page about our evening walk at Portnahaven, which was the last walk of the week. Now only (a) page(s) about the departure from Islay and travelling back to Swindon are missing. Hope to get that done within the next few days. I also need to update the Blogging Abroad (Expat Bloggers) page, I've got about five pages to add again now. However, should the weather forecast turn out to be right, all of this will probably be put on hold and I'll try to put in some evening walks. WalkWeb has a few good suggestions: Malmesbury to Cowbridge is just over four miles, which I should be able to do in an evening quite easily. North Wraxall to Ford is also around 4 miles, the only problem could be getting there in the evening (traffic could be a problem). Or I'll just get up on the Ridgeway somewhere. I'm sure I'll find something.